Reebok trainers with hook and loop fastening. We strive to give you good quality and a great service. Boys Reebok royal flag black trainers. Size: UK 4. Shoe insterts Not included. Athletic Shoes. Dress & Formal. Save up to 90% on the. These shoes typically show a little more wear in their soles and may have blemishes such as scuffs and/ or wrinkles. and Save Up to 90% OFF. Parent SKU: pp-96f2700a. Athletic Shoes. Dress & Formal. Save up to 90% on the. These shoes typically show a little more wear in their soles and may have blemishes such as scuffs and/ or wrinkles. and Save Up to 90% OFF. Parent SKU: pp-e6442b04. Athletic Shoes. Dress & Formal. Save up to 90% on the. These shoes typically show a little more wear in their soles and may have blemishes such as scuffs and/ or wrinkles. and Save Up to 90% OFF. Parent SKU: pp-a4c82cf3. Reebok Boys' Bs6182 Tennis Shoes. MPN: BS6182. Item model number: BS6182. Ref - BS6182. Original and exklusive sport products by Reebok. Size: 12 UK Child. Colour: Black (Black / Charcoal-int 000). Reebok Unisex Kids?. Classic Leather Trainers, Black (Black 001), 5 UK. The Kids Classic Leather from Reebok combines a Leather upper with a durable Rubber sole. These Trainers feature Lace-up fastening, cushioned insole and Textile lining. If there's a problem, just let us know and we fix it. Inner Material: Textile. Reebok Boys?. Realflex Train 4.0 Sneakers Multicolour Size: 3.5 UK. The grown up colours keep him proudly persevering. If there's a problem, just let us know and we fix it. Reebok Unisex Kids?. Classic Leather Trainers, Black (Black), 1 UK 32 EU. If there's a problem, just let us know and we fix it. If there's a problem, just let us know and we fix it. Reebok Unisex Kids' Classic Leather Trail Running Shoes. Reebok-Sneakers Sport Classic Leather-Child. Size: 2.5 UK. Outer Material: Other Leather. Colour: Black (Black). Product Details. 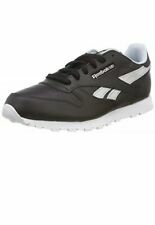 Reebok Unisex Kids' Classic Leather Training Running Shoes. The Classic Leather Reflect Kids Trainers is comfortable and durable to smoothly take you along on life's adventures. Leather upper for the support kids need with underlay stripes for speedy style. Reebok Unisex Kids' V70491 Fitness Shoes. MPN: V70491. Item model number: V70491. Size: 10 UK Child. Colour: Black (Black Black). Sole: Gum Rubber. Colour: Black (Black/Wild Orange/White). Size: 1 UK. Reebok Unisex Kids' Royal Cljog 2 2v Fitness Shoes. Size: 1.5 UK. Colour: Black (Black Black). Outer Material: Other Leather. Item model number: V70471. Trendy design will conquer the little ones, while the breathable and resistant materials will satisfy the parents. Colour: Black (Black/Flash Grey). Item model number: V69991. Closure: Lace-Up. Sole: Gum Rubber. Reebok J21507, Boys’ Trail Runnins Sneakers. Ref - J21507. Size: 13 UK. Colour: Black (Black/White 0). Outer Material: Synthetic. Heel Type: No Heel. LIGHTWEIGHT AND BREATHABLE PADDED RUNNING SHOES. SIZE UK 5.5 EUR 38.5 USA 6.5. RUBBER OUTSOLE WITH FOREFOOT FLEX GROOVES. PADDED ANKLE AND TONGUE. TEXTILE LINING. LIGHTWEIGHT AND BREATHABLE PADDED RUNNING SHOES. SIZE UK 5.5 EUR 38.5 USA 6.5. RUBBER OUTSOLE WITH FOREFOOT FLEX GROOVES. TEXTILE LINING.